Dendreon (DNDN) shares sank in early trading on Thursday, paring earlier premarket losses of 23%, after the Centers for Medicare and Medicaid Services (CMS) said on Wednesday it was evaluating data on Provenge, the company's prostate cancer vaccine, to decide whether to cover the product for seniors nationwide. The CMS said it initiated a National Coverage Analysis (NCA), and in it the agency is requesting public comments on the effects of Provenge on health outcomes in patients with prostate cancer. The CMS said it will determine if the treatment is "reasonable and necessary" for patients in Medicare, according to Reuters. Medicare covers 45 million elderly and disabled Americans. After Dendreon's breakthrough prostate cancer vaccine was approved in April, the company's shares soared, continuing their general trend. The company has since admitted there isn't currently enough of the drug to meet demand and that patients face rationing. Still, there's no denying that nationwide Medicare coverage could help sales, especially next year when Dendreon's plants operate at full capacity. However, denial of Medicare coverage would seriously dent Provenge's success. In a statement, Dendreon tried to calm investors, saying "It is not a change in Medicare coverage policy." Dendreon added that "NCAs do not impact existing coverage decisions, nor do they restrict local Medicare contractors from covering Provenge. Therefore, Medicare beneficiaries are still able to access Provenge and private payers can also still cover Provenge." CMS said a proposed decision is expected by March 30, 2011, with a final ruling in June 2011. Provenge is a treatment for men with advanced prostate cancer. 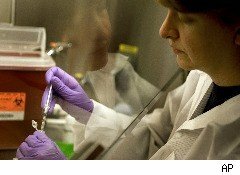 It is produced from a patient's own white blood cells and then trains the patient's immune system to attack the cancer. The cost of a full-course of treatment is $93,000 ($31,000 per infusion), making Provenge one of the more expensive drugs on the market. Several analysts called the sell-off in the shares overreaction, and some suggesting to take the opportunity to buy the shares.